The Autism Alliance of Michigan (AAoM) would like to formally congratulate our partner, The Detroit Zoological Society (DZS), for being recognized by the Association of Zoos & Aquariums (AZA) for Significant Achievement with the 2015 Angela Peterson Excellence in Diversity Award for the Inclusive Experience. The award honors significant achievement in work force and audience diversity among the 229 AZA-member institutions. The DZS was recognized for its efforts to accommodate diverse audiences by offering special accommodations for Detroit Zoo guests affected by autism. Over the past few years, Autism Alliance of Michigan has proudly supported the Detroit Zoo’s efforts in creating a truly inclusive environment. AAoM has created and maintained a social narrative for individuals with autism that helps set expectations for animal habitats, rides, attractions and other experiences at the Zoo. AAoM’s Safety Specialist has trained all full and part time Zoo staff and seasonable employees on welcoming guests with autism and creating an inclusive environment. For organizations, businesses and venues looking to become more autism-friendly, please contact our Program Assistant, Kat Nelson at Kat.Nelson@aaomi.org or 248-436-5604. 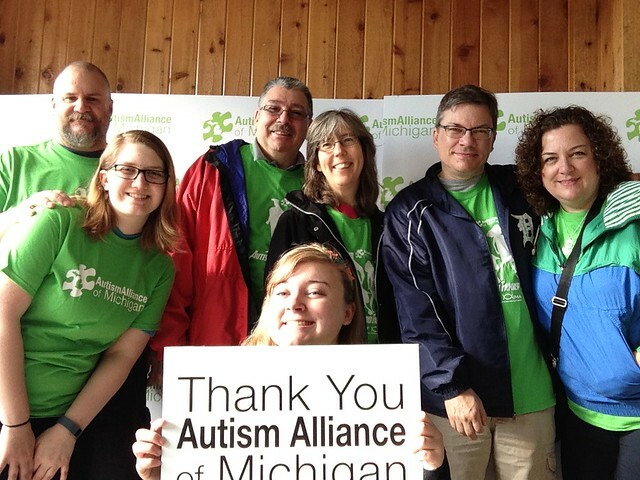 Enjoy these photos from last year’s Autism Hero Family Walk at the Detroit Zoo. Mark your calendars for next year’s walk on Sunday July 31st at the Detroit Zoo.